One of the reasons I love doing what I do here is that I get to explore the online world of making money and I see new and innovative approaches that can be quite exciting to investigate. I saw this ad this morning on a platform where I feel like I am spammed left, right and centre with this kind of stuff. I usually see multiple ads with the same or similar wording from a number of people, but I hadn’t this seen this particular ad before. I couldn’t help myself and I clicked to investigate further. As a side note, when I click on random ads like this, I’m always careful to use an email address where I fully expect to get spammed. Never use your important email address (like a work email, or your every day business email) to sign up for programs like this, just in case. Let’s get right to it. This offering is called Impact101, and I’ll be reviewing it for you today to understand what it’s all about, and whether it’s worthwhile. Price: Starts from $25, plus donations. Recommended: I don’t feel that I can or should recommend this one, but I’m interested to see how this one pans out. Many people know about crowdfunding platforms, and have possibly even donated to people whose stories have touched you in some way. Crowdfunding platforms are an excellent way to donate money to people online to support them achieve a particular goal. Some of the more common platforms you might have come across include GoFundMe, Kickstarter, Indiegogo, Crowdrise, Razoo, Crowdfunder and Crowdrise. There are plenty more. There are a number of campaigns shown on the homepage ranging from paying for medical bills and education to saving bees and supporting Alzheimers research. What I didn’t understand about this website was, why am I seeing ads about this platform making ME money, when crowdfunding is all about making donations?? That’s not how the traditional model of crowdfunding works. So what was I missing? It’s more complicated than choosing someone you’d like to donate to. Whilst this is about donations, it’s also about you receiving donations. They call it ‘person to person crowdfunding’. Let’s look at each step in a bit more detail. You need to sign up to Impact101, and choose a 6-month membership for $25 or a 12-month membership for $40. You then make a one time out-of-pocket donation to two people. 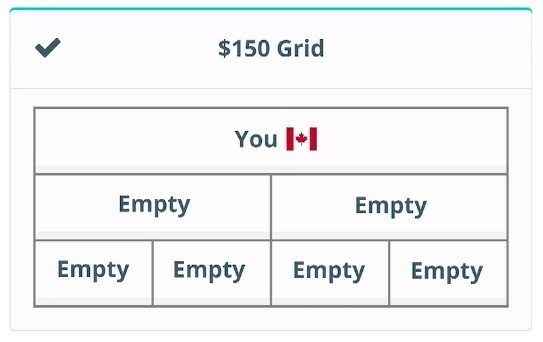 This out-of-pocket donation gives you a ‘donation grid’ so that you can start receiving donations. According to Impact101, once you‘ve chosen your membership, you then choose the donation grids you would like to participate in. You will pay 50% of the donation for each grid level to the person that invited you to Impact101. You will then be notified of the other person you need to pay the other 50% to based on where you came into each grid. You may or may not know this person. You need to be in the grids in ascending order. 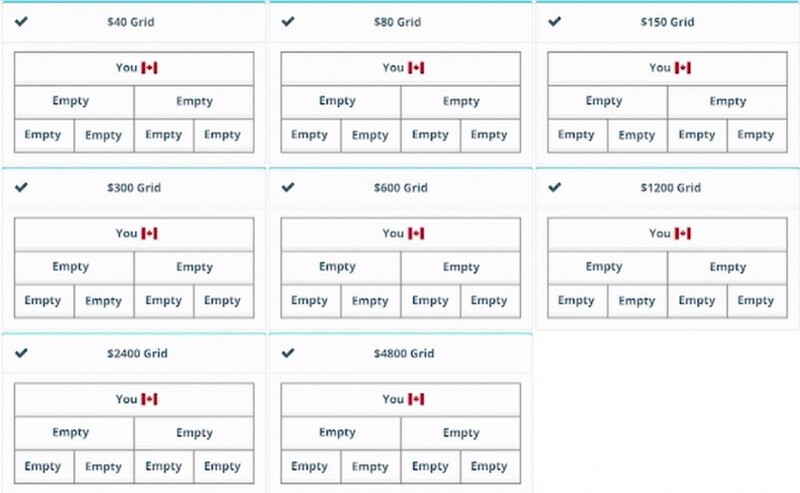 For example, you must be in the $40 grid in order to be in the $80 grid; and you must be in the $80 grid in order to be in the $150 grid, and so on. Therefore you need to choose the combination of grids that works for your situation. All donations must be paid immediately. You will not be placed in a grid until the donations to your inviter are made and confirmed. You also cannot invite others to Impact101 until the donations to your inviter are made and confirmed. Spread the word. In this step, you use the tools that will be provided to you as part of the membership fee so that at least two other people join and donate. A fully customised and personalised mobile landing page to promote your cause and your platform. A personalised website for your marketing. A campaign builder to build and promote your cause. A back office which tracks all of your activities in real time. You would then be responsible for creating ads (like the one I saw on social media) enticing me to click, see your landing page with Impact101 videos, and join. The idea is that you do this on repeat. This is the step where you see the money coming in, provided you are recruiting hard enough. I found the grids a bit confusing. It seems you can have multiple grids running simultaneously. 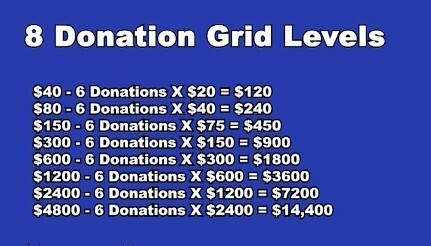 If you were to have all 8 donation grid levels going, it would mean that you have paid $9,570 to have ‘bought into’ each grid level. 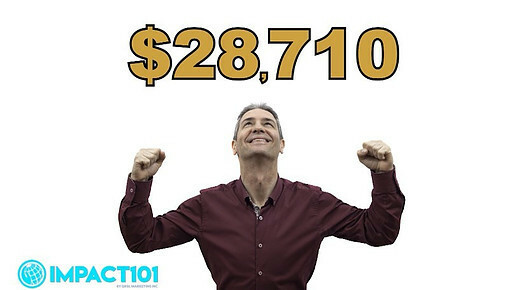 If you were to fill each grid (through referring people, and then those people refer others), then you would bring in $28,710. Once your first donation grid at a level is completed, you must have introduced two registered, active participants in order to have a new grid open up for you at that level. As long as you have invited a total of at least two registered, active people at a grid level, you are then qualified to continually have a new grid open up for you at that same level each time you complete a grid. This is for each grid level that you are participating in. I was pleased to see names and photos of the founders on the website, and they do appear to be real people. So that’s a bonus. Interestingly, in no way shape or form do I hear anything about QR codes on this website, so the Impact101 website must constitute the ‘crowdfunding module’ of a larger business model. I’m also really unsure what the campaigns shown on the homepage are all about. I clicked on several of the campaigns for further information and to donate, yet the ‘donate’ buttons were not activated, and I’m not sure that the campaigns are ‘real’ campaigns’ as the information on some of them sounds quite generic. It’s unclear to me why these campaigns are shown on the homepage if you can’t donate to them, and they couldn’t follow the model described in the videos where you need to donate to your referrer. Perhaps finding the page through google search and donating out of the kindness of your heart to the campaign of your choice makes that campaign your default referrer?? I have no idea and it is not clear on the website about how that aspect works. I am yet to see evidence online whether they are actually paying out the donations or not, so at this point I can’t comment whether the model is working or not. I haven’t found anything to say they aren’t paying out, so that’s a good thing. One of my big concerns with this one is that this absolutely DOES sound like a MLM. It relies on you referring others, getting them to sign and donate, and then repeating the process with other people. I’m also uncomfortable that on the surface it looks like a donation site, but in reality it’s a recruitment drive to get others to buy in and ‘donate’ to you. This is like a cash gifting scheme with a twist. So I can’t say that this is not legit, but I can’t endorse it either because it feels ‘off’ to me. I can’t recommend anything to you that I don’t believe in therefore I will not be recommending this one. I will be following this one closely to see how it goes. It’s very new to the market, only being established in early 2019. I don’t like to take risks on online ventures unless I know they are tried and true. If you are looking for a substantial and long term way to make real money online, go for something that is reputable, that has a proven track record, and has an ethical business model. My preferred platform allows people to sign up for free to have a look around and see if it’s for them. You even get two free websites, and the first ten modules of training for free to show you how to set up your own online affiliate marketing business. What you see is what you get. Nothing hidden, and nothing over promised. 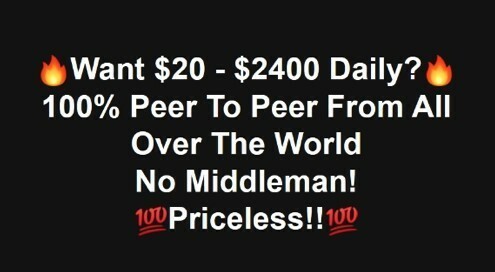 I personally use this platform and it is a genuine way to learn how to make money online the right way, using legitimate techniques and methods. If you have any comments or questions, please ask and I'm always happy to help. If you've experienced Impact101 I'd be very keen to hear your thoughts if you'd be willing to share.